First half underway and early action on 4’ not on our behalf this time. Schaub marches against our box dribbling through our defensives and passes a clever one to Clemens who shoots but Himmelmann drives it to a corner with his foot. Great danger there saved by Himmelmann. Both teams seemed thirsty for an opening goal but Köln had definitely the upper hand. A team that played in Bundesliga the previous season, with three ex Sankt Pauli players in the squad , having suffered no major losses and placing themselves amongst the favorites for direct promotion. Their game play in the midline and their defense line were a class higher than Bundesliga 2. Despite that though, we didn’t fall back in threatening their box. On 9’ Dudziak shoots a nice shot against Horn but sends the ball a little above the upper post. On 11’ Flum drives a shot from Schaub to a corner and then on 13’ the underdogs finally got to bite. Pressing high finally bared fruits. Rise passes the ball weakly were Veerman stood. Veerman controls the ball and shoots, leaving no chance to Horn. 1-0 for Sankt Pauli. 5 minutes later, on 19’ Sobota tries his foot but this time Horn sends the ball to a corner. An early unexpected opening goal that stunned Köln who at the moment felt desperate having no solutions. Sankt Pauli kind of dominated the field mostly with Möller Daehli organizing the attack, trying to find the gaps in Köln’s defense. It was Buchtmann though on 25’ who cleverly opened a high ball for Dudziak in the heart of Köln defense. 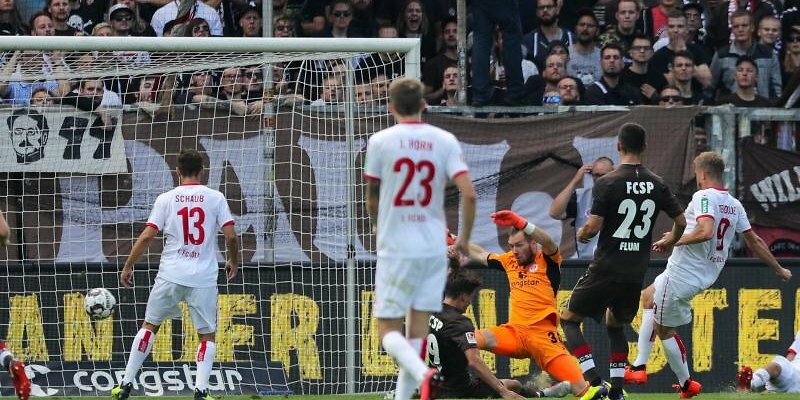 Dudziak got the header and doubled the score for Sankt Pauli. Too good to be true though. Köln is a team that can’t easily be shaken and stunned. Our second goal was a wake up call for them. On 35’ Schaub drives a really horrifying, flanking, high ball to Clemens who gets the header and turns the score into 2-1. And not only that. On 45’ Köln proved to be the team that knows WHEN and HOW. Clemens with the ball in our box taking some of our defensives on him. Before he looses the ball he sends it to Drexler. Drexler cleverly passes to Terodde who shoots almost alone turning the score into 2-2. Köln with three passes managed to dissolve our defense and find the gap they needed. Final whistle to this first half seemed so liberating. Second half underway and we are back to base one. 2-2 and all could happen. Some action for Sankt Pauli in Köln box. Their defensives now knew the drill and kept sending our attacks to corner kicks which we could never find a use for. Then out of everything, the worst scenario happened. On 52’ Köln in our box. Really theatrical fall of Drexler against Buballa. The ref won’t fall for it but then it is Himmelmann who falls on Terodde’s feet. A legit 11 meter kick for Köln. Terodde makes the score 2-3, and now it is us running to catch up. 5 minutes later, on 57’, the counter attack for Köln. Their game consisted of quick and fast passes to each other. In zero time the ball reaches our box. Schaub leaves the ball to Guirassy and Guirassy turns the score to a heavy looking 2-4. And just when everyone thought it was over, Sankt Pauli would just laugh at their face. On 65’ Sobota sends the ball to Buchtmann who shoots a clever lobe against Horn who couldn’t react at all. 3-4 and Sankt Pauli was back in the game. On 68’ we ALMOST touch the 4-4. Knoll shoots from something like 20 meters away behind the wall before him and Horn barely manages to drive the ball away to a corner. So close. Sankt Pauli had Köln tight to their box hammering on with whatever we had. On 79’ a corner kick and Veerman on the ball but Köln clears it. 6 minutes of extra time and what we hope is for our fourth goal to make the day glorious. On 90’+2 Sahin sends a ball to Köln’s defense but Sobiech clears it to a corner. Then on 90’+5 came THE FUCKUP. Buchtmann with the ball trying to organize a new offensive. Ball stuck somehow and instead of him sending it to a Sankt Pauli player, he sends it directly to Özcan. He marches against our box shooting the damn thing to our nets, ending the nightmare for Köln. Final whistle for the game left everyone thinking. So apparently we suffered another loss with a high score against us. But is it maybe that we can’t see the forest for the trees here? FC Köln is most likely going back to the 1st league after this season. Their football hasn’t changed a bit from the previous season and this is obvious even by just seeing their results. The only time the stayed low on goals was with Union (the other candidate for promotion), where they stayed in 1-1. Every goal FC Köln achieved was a well worked plan in training. The way the switched places and the way they moved in the field proved a team with a plan. Even the way they reacted after our second goal. On the other hand, we are a team that still needs work and most of our goals are a product of working in the midline and under circumstances and many luck, a shot here, a shot there and something will happen eventually. I mean….Köln was throwing hammers on us and we were trying to fight back with pitchforks. Sad but true. Can’t be sure how these guys will continue, but judging on their game play, and what they’ve worked in the field so far…I don’t see how they’ll miss promotion. Fighting with pitchforks against a beast like that and actually giving them hell in most of the game. Even in the end. A very fragile 3-4 which of course they needed a penalty to achieve and the ball was constantly to their box. All it took was a mistake from us to make them secure the game. So …NO. This game had nothing to do with what happened in Union. We may have lost but not hands down and not humiliated under no circumstances. Yes there are plenty of points we need to improve and to be totally frank with you I don’t think we have that much of a quality to claim promotion. But giving such a fight against the best of the league? Got to be kind of proud of that actually. This week there’s no game as there will be national team games. Sunday the 16th we play against Aue. We’ll see if what we’re sayin’ here is right but something tells me that we’re gonna get some credit back out of those poor bastards. FORZA SANKT PAULI. Matchday 03: FC Union Berlin vs FC Sankt Pauli 4-1 !!!! !